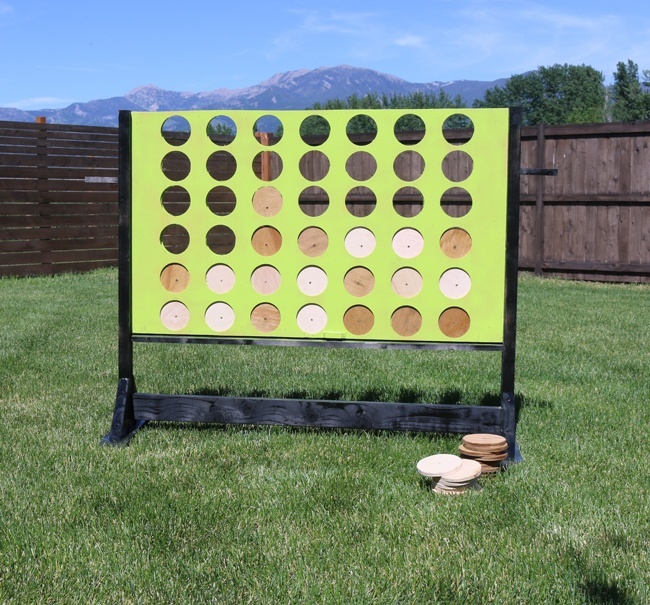 This Four in a Row board is a really fun addition to any back yard. It's enjoyable for everyone in the family to play! The board has a fun look to it when it is out but easily stows against the wall of your house. This project is lots of fun to make and really rewarding to finish! I hope you try it out! Thanks! The first task in this project is to cut the plywood to size. 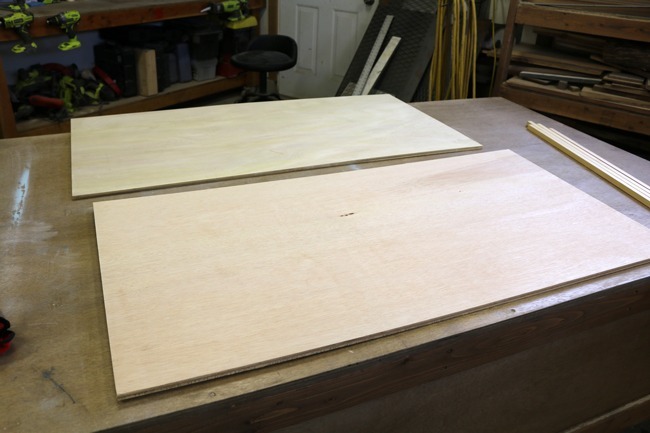 You will need to use a table saw or circular saw to cut two equal sized pieces out of the plywood sheet. These will form the sides of the Four in a Row Board. Next you we will cut out the slots in the board for the game pieces and we will cut out the pieces themselves. 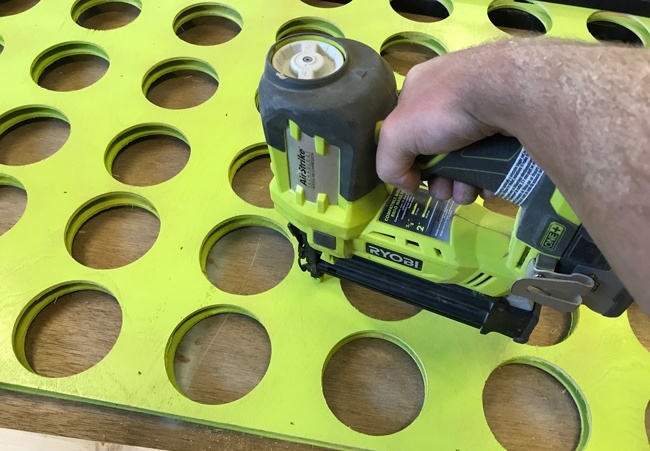 On the cut boards you will need to measure out a grid of 6×7 holes that are spaced evenly. Use a hole saw to cut out these slots. Sand the edges of the slots as the will be rough after the hole saw. Next, cut out the game pieces. 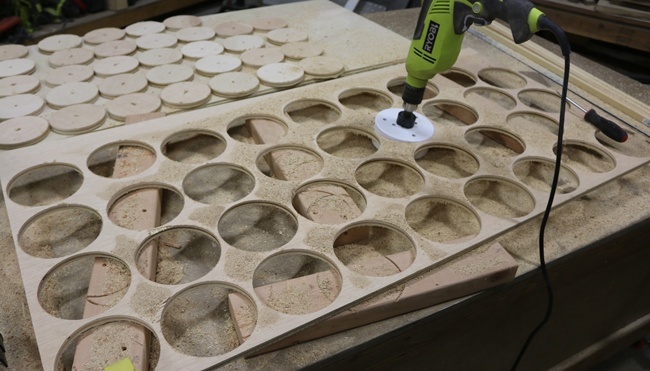 Use the larger hole saw to cut circles out of the additional plywood. Try to get as many as you can out of the plywood, you should get around 32 pieces. Sand all of the edges of the circles. Now you will have to paint the game board. After you have sanded the boards, make sure they are free of saw dust. Then put a light coat of spray paint on. 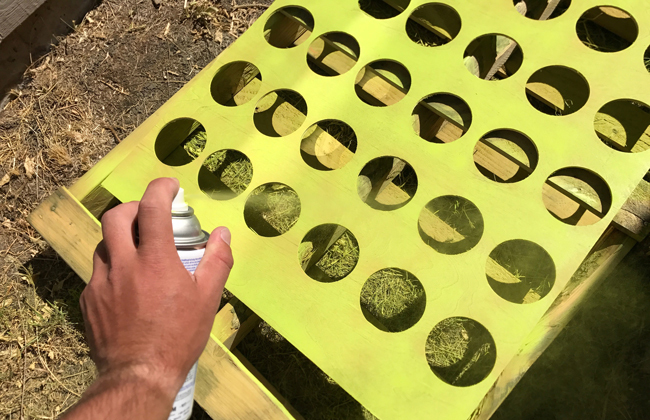 Once that has dried, give the boards a light sanding and then put at least 2 additional coats of spray paint on. Note: I chose to leave my game pieces with a natural wooden look but if you want to paint them, follow the same process as for the boards. Place the 8 spacers, strips of wood that we cut, between the two game boards and between each of the rows. Use a nail gun to attach each board to each spacer. Add the legs to each end of the game board and fasten the bottom stop between them. Play some Four in a Row! Now its time to enjoy your new Four in a Row board! For a more complete tutorial please visit Ryobi Nation.